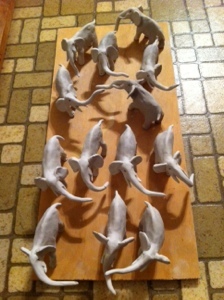 I’ve been making elephants all day long. 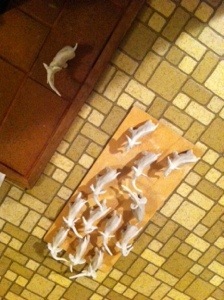 And tomorrow I will make some more. They have an interesting shape to start with. It’s a tear drop shape, which given the plight of elephants these days, is quite poignant. I pull this tear drop tip out long enough until I have a long truck. Then I add all the rest. Each elephant is then on its own to express it’s self, I just keep it upright while it’s deciding. 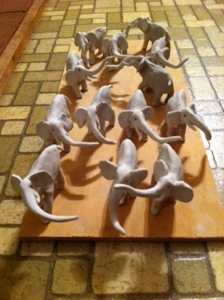 This entry was posted in blog and tagged Elephants, figures, porcelain by nancywalker. Bookmark the permalink. Hi NN ..! I am in Thailand. Visiting Sophie who now lives here. Elephants everywhere. So wonderful seeing yours as you have caught their ‘mojo’ completely! Aren’t they magnificent! !